From economy to digital models, ovens for every lab application. 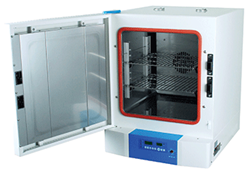 Digital Mechanical Convection Ovens quickly dry and heat samples. Save time with fast heat-up and uniform temperature throughout the chamber for greater drying efficiency. Program and control through PC, if desired. Economy Mechanical Convection Ovens deliver forced air convection with PID temperature control. Include auto-tuning and calibration features typically found on more expensive units. Set digital timer up to 99 hours. Economy Gravity Convection Ovens provide gentle airflow for sterilization and drying. Two adjustable vents control air and vapor circulation. Preset up to three settings for quick recall. View the full line of Cole-Parmer® StableTemp™ Laboratory Ovens at ColeParmer.com/21500. For more information, call 800-323-4340. Cole-Parmer has been a leading global source of laboratory and industrial fluid handling products, instrumentation, equipment, and supplies since 1955. Our product lines, including popular brand names such as Masterflex®, Oakton®, Digi-Sense™, Environmental Express®, Ismatec®, and more, are sold through company-owned customer channel outlets and a strong network of international dealers. We also feature an ISO-17025-accredited metrology lab for instrument calibration and repair. Cole-Parmer responds with excellence to customer needs and offers application expertise and technical support. For more information, contact Cole-Parmer, 625 East Bunker Court, Vernon Hills, IL, 60061. In the US, call 1-800-323-4340. International customers, call 1-847-549-7600. Visit us at ColeParmer.com.